Your favorite household cleaner might be sucking up more than just dust; think the blueprints to your house as well. Once again we’re faced with the dilemma of modern technology making life easier –but at a price. This story is vaguely reminiscent of another tech news story where the recordings of an Amazon Echo (aka “Alexa”) were a topic of debate during an Arkansas murder case. Yes, I’m saying it, but it seems as if it has become increasing difficult to evade eavesdropping appliances! Although I’ve never owned a Roomba, up until now I’ve always loved the little robot because of its popularity with pets. 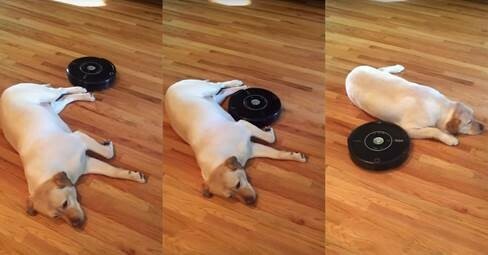 The internet is full of hilarious videos of Roombas vacuuming around sleeping dogs, or cats hitching rides.